I was reminded today about a few things in life that make me take a deep breath, look skyward and say "life is great". It rained today. The first time in a while and even though I was grumpy for having the sniffles and still obligated to be out and running errands, the smell of the new rain and the cold little droplets hitting my skin and making little dark spots on my clothes, well, it's fantastic. Which leads me to #1. Getting caught in the rain. I'm not talking about the few drops you catch in a drizzle while running from your car to the door. I'm talking about the times you're caught in a situation where there is no shelter and mother nature has unleashed and your clothes hang heavy with wetness and your feet slosh in your shoes. There is one time that comes to mind. In college, another classmate and I were walking to the bus, which was never on time. It had been raining lightly, but steadily all day, but just as we were approaching the bus stop the downpour started. The rain was so intense that in the time it took us to run one block we were saturated from head to foot. As we ran with our backpacks bouncing, I felt my shoes and jeans getting heavier and heavier with the weight of the water. Water was running over our faces and we were laughing so hard that my stomach was sore. We sat in the bus shelter dripping puddles and I couldn't remember being happier. I think I love the coldness of being wet. Even if it's a hot day, stand around in wet clothes and you will feel a chill. It's exhilarating. It heightens all other feelings, physical and emotional. #2. Late summer flowers. Some people know this about me: My dream is to have a you-pick flower farm where there are rows upon rows of flowers with narrow paths between. Not likely to happen here in suburban Baltimore, but hey it's a dream. 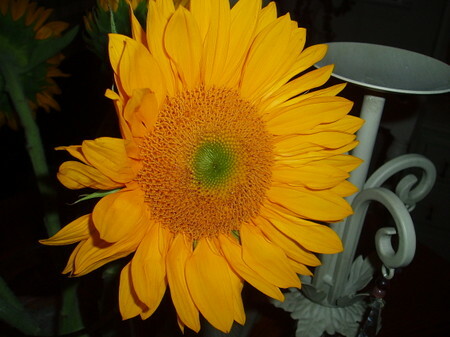 Zinnia's are my favorite summer flowers, but sunflowers are what I found today at the market. I hope all of you buy yourself flowers once in a while. I used my mother-in-law's visit as an excuse to brighten the house, but any excuse is a good one in my book. My days are filled with efforts to make each little aspect of mine and my husband's life beautiful in some way and here are these perfect flowers, with all their inspiring colors and soft curly leaves and the scents that can be at once nostalgic and fresh, and these little perfections came from nothing but tiny seeds, dirt and water. It drops my jaw when I think about it. I consider them one of God's thoughtful little gifts to us. 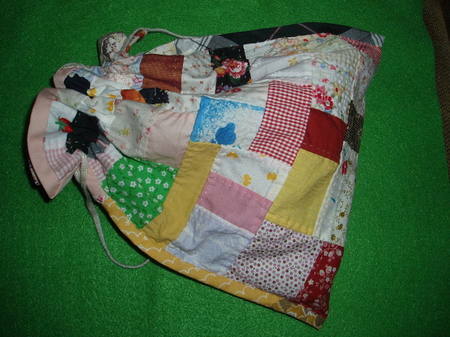 An amazing drawstring bag from Mai over at Etsy. Unbelievably she sews all her wares by hand! And here I am trying to avoid handsewing at every cost! The online crafting boom has really enriched my life. There are so many talented people out there that we all now have access to. How lucky are we?! #4. Crying. Yes, that's right folks, there are times I love to cry. I'm of the school that any emotion is a good emotion. My favorite quote is from the Aeneid and it goes something like this: "sunt lacrimae rerum". Literally translated, it means "there are tears in things" and it's true... Happy or sad, we always cry if the feeling is strong enough, so why not embrace it. I guess that's all the introspection I'm going to assert on you today. I Hope you will take a moment to remember the little things that bring you happiness. I intended to post pictures of the shoebox Aaron and I call home, but it's been overcast and the apartment is quite dark and hard to photograph. Perhaps another day.